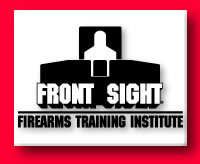 Someone on the IPSC mailing list asked a general question about the Front Sight training facility and its founder Dr. Ignatius Piazza. This was our editor's response. As luck would have it, the question came up a few days after our trip to Front Sight for their Two day Tactical Shotgun course. The question was based on a recent press release from Front Sight regarding the availability of their GLOCK firearms armorers course. The poster was looking for any experience or insight anyone was willing to offer. My personal impression is that it would be difficult to find better training. There may be other schools that do things as well, but I can't imagine what they would do that would make their courses better. The students were treated as _customers_. Every opportunity was taken to attend to comfort issues -- toilets and handwashing stations on every range, heating even in the temporary structure, fully stocked pro-shop including rentals of any sort of equipment you might need all the way down to several different choices of Chapstick. There was a real training curriculum that was carefully followed, yet left time to work with and correct problems of individual students. The mix of listening-watching-doing was well-crafted and well-presented. Our instructor was doing the class for the first time, yet he was better prepared and more competent (both at the skills and the teaching), than many instructors I've experienced both inside and outside of the shooting disciplines. And the Shotgun course RangeMaster was on the sidelines as an additional instructor, both to help with the students and make sure the class stayed on course. On the firing line during drills, there was constant feedback and tweaking of skills. New targets were put up constantly (an easy thing to be "cheap" about). Basic skills were repeated for correctness and added to during each subsequent class component. I learned a lot in a two day class. One thing I earned is that I want to go back for another class. During closing ceremonies, they even provide you with several blank targets from your class to use or dry practice at home. The facility is still under construction, but what is there is already first-rate. Each range is neat, clean, and well appointed. There is an attention to detail that belies a general attitude of quality. We did a final tactical exercise in a small canyon we had to drive to. Anyone can have 360-degree shoot- houses -- this sort of thing requires that you buy the right sort of property. It's already a very good facility. I look forward to what it will become. And I don't want to leave out Dr. Piazza's lectures. He's a comfortable and effective public speaker. His coverage of the Ethical and Moral Issues regarding the use of Deadly Force, the Legal and Civil Liabilities of Self-Defense, and the "Color Codes" of Mental Awareness are all top-notch. He credits Ayoob, Cooper, and others in the lecture notes. He's not pretending all of the material is his. His presentation is compelling and effective and his interest in the topic and his students is genuine. All that concern for quality and effort to do things as well as possible both comes from and feeds a certain attitude. There is a "we are the best" thing going on. But I didn't find it obnoxious and they never spoke ill of others in the business. The more my Associate Editor and I reflect on the experience, the more clear it is that the Front Sight folks have been careful to do things as best as they can imagine how to. It's hard to fault them for being proud of their success. There is some "selling" of the Front Sight vision including memberships, supporter programs, and even home-sites in the community being created. But these are all done during the lunch break and clearly marked in the syllabus as "for those interested". There is no hard sell at the end. The plans and program are presented, questions are encouraged and answered, you are free to do as you choose. Since this topic originally started because of the recent advertisement of the GLOCK Armorer's course they are offering, I'll add my two cents on that. Yes, the pitch seems a little overblown, but it _is_ advertising. Yes, some civilians can get into the GLOCK class, but you need to be connected and work at it. You can't just send GLOCK some money and go. It's a bit expensive, even at the "reduced" rate, but if my other experiences mean anything, it will far exceed the standard one-day course and quite likely the advanced course. Dr. Piazza, who is a GLOCK fan, will have found the best people he can to run the course and there will be a small army of knowledgeable folks to assist. You'll leave after two-days with all you need to know and a sense that your money was well-spent. Few organizations I've encountered understand how valuable their reputation in the community is. PS: To provide full disclosure, our site has an advertising relationship with FrontSite in which we earn the right to purchase training certificates which we use as promotional/sponsorship items, frequently as prize table items for matches. No real money changes hands as part of that relationship -- we paid for our rental guns and used a certificate earned with advertising revenue to attend the course. Nothing has been offered for free in exchange for coverage or our positive opinion, nor would it be accepted if it were.